CHARLESTON, S.C. — Nine people are dead and several others were injured after an unidentified gunman opened fire during a worship and prayer service at a historic African American church in South Carolina Wednesday night. 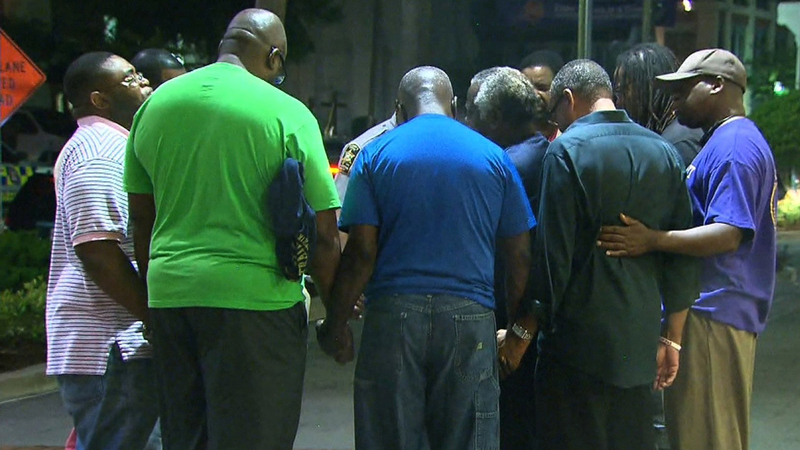 The shooting occurred at approximately 9 p.m. local time at Emanuel African Methodist Episcopal Church in Charleston. The suspect is believed to have attended the service for about an hour before standing up and spraying the room with gunfire, reloading several times. According to reports and still-shots of surveillance video outside of the building, the light-skinned suspect had worn a dark wig and plastic nose and sunglasses to conceal his identity. He is believed to have escaped in a dark four-door sedan before police arrived. When authorities arrived on the scene, they found eight persons who were already deceased. One church member was transported by ambulance to the hospital, but died on the way. Among the dead was Emanuel AME Pastor and Senator Clementa Pinckney, 41. Mayor Joseph Riley, Jr. condemned the bloodshed as well. Police Chief Greg Mullen has vowed to find the perpetrator as a manhunt is underway today. The FBI has joined the investigation. Police believe that the suspect is a clean-shaven man in his early 20’s with sandy blonde hair. He appeared to be wearing multiple layers of clothing upon entry to the building. A motive is not yet known, but officials suspect that the shooting was racially motivated.